This article featured on RedskinsCapitalConnection.com. Alfred Morris was drafted by the Redskins in the 6th round of the 2012 NFL Draft. Since Morris entered the league he has been nothing short of dynamic, rushing for over 1,000 yards in three straight seasons while averaging 4.5 yards per carry. The Redskins hired Bill Callahan on January 15, 2015 from division rivals Dallas Cowboys to be the Redskins’ offensive line coach. Ever since Scot McCloughan took over the general manager duties for the Redskins, the Redskins have stressed the need for “big, tough, nasty, strong guys.” The hiring of Callahan fits this goal and was further evidenced with the Redskins selection of Brandon Scherff with the 5th overall pick in the 2015 NFL Draft. So what does this mean for Morris? In this breakdown, however, we’ll look further at the schematic differences between the two offensive schemes as a supplement to the discussion from before. The Redskins under Mike Shanahan and Jay Gruden primarily ran a zone blocking scheme using the outside zone stretch to set up the inside zone run. Here is an example of the Redskins current outside zone play using “21” personnel (two running backs and one tight end). This was a very common play for the Redskins last season out of the I-formation. I highlighted the “King” combination playside block between the right tackle and the tight end. After Morris gets the ball he follows his blocks around the right side of the formation patiently waiting for the hole to form. It eventually does form between the right tackle and the tight end and Morris escapes upfield for a large gain on the play. 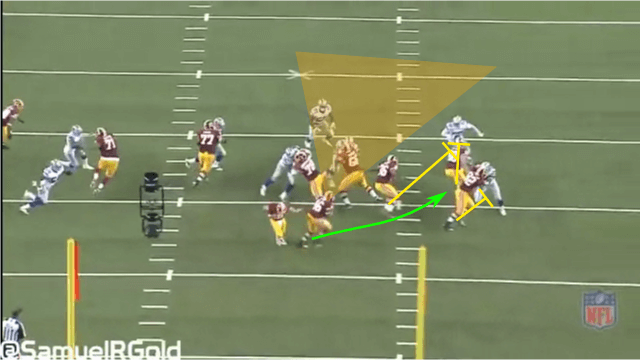 Here is an inside zone running play the Redskins used in combination with the outside zone stretch. In this play, Morris is targeting the hole between the center and the right guard. 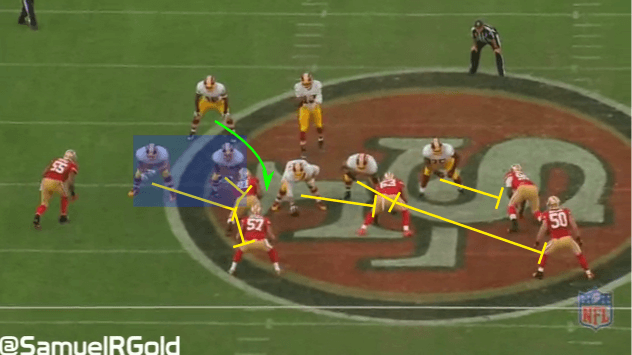 I highlighted the combination block between the right tackle and the right guard. Morris follows those two upfield and eventually gets taken down by the linebacker after a 5 yard gain on the play. Although this play wasn’t as successful as the outside zone stretch due to DE91 Ray McDonald taking on the double block it still gained 5 yards which is impressive considering the lack of open running lanes. Before we begin looking at Callahan’s blocking scheme I always find it interesting looking at a coach’s history and what players and coaches he’s worked with in the past. With the help of Pro-Football-Reference you can see that Bill Callahan has been a coach of a variety of large college programs including Illinois, Wisconsin, and Nebraska, as well as different NFL teams such as the Raiders, Jets, and Cowboys in the past 30 years. Callahan was actually the offensive line coach for the Raiders under Jon Gruden in the late ’90s before becoming head coach of the Raiders. In his first year as head coach in 2002, Callahan led the Raiders to a Super Bowl appearance versus his former boss Jon Gruden unfortunately losing to him 48-21. He later joined the Jets in 2008 where he coached three of his offensive lineman – center Nick mangold, guard Alan Faneca, and tackle D’Brickashaw Ferguson – to the Pro Bowl. All three repeated this feat in 2009 and additionally broke the Jets franchise record gaining 2,756 yards on the ground leading the NFL in rushing yards per attempt (4.5). Callahan joined the Cowboys in 2012 and helped reshape their offensive line picking multiple first round offensive lineman including center Travis Frederick, guard Zach Martin, and tackle Tyron Smith who all three made the Pro Bowl in 2014. If you are a Redskins fan this should make you very happy to read as the Redskins offensive line has been a weakness of the team ever since Chris Samuels retired in 2010. One more thing to note is that Bill Callahan was also the offensive coordinator for the Cowboys from 2012 to 2014 and was given play-calling duties in 2013. So it wouldn’t surprise me if he took these duties from Jay Gruden to allow him to focus on game-management just like Jerry Jones did to help Jason Garrett. First Callahan doesn’t run one blocking scheme. 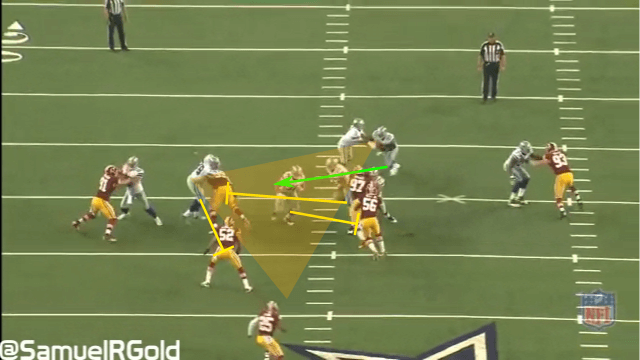 Callahan with the Cowboys actually ran a variety of concepts including zone-blocking concepts the Redskins are already accustomed to, but also man-power running plays that the Redskins rarely ran in the Shanahan-era. 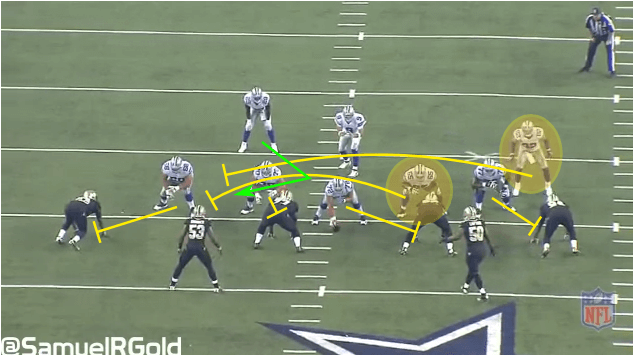 For example here is the Cowboys running the counter power versus the Saints. This is a man-power concept that I actually broke down fully in my Le’Veon Bell article last season, but here it is in the context of the Cowboys. 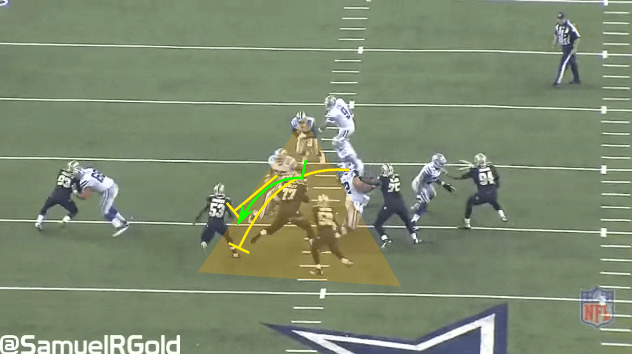 In the first image I highlighted the the backside guard who pulls across the formation and tight end Jason Witten who runs across the formation behind the pulling guard to “logjam” block his defender. Here Murray gets the handoff and reads the blocks infront of him to make sure there is no immediate pressure. Next Murray steps up to the line of scrimmage and then cuts outside following LG Leary and TE Witten across the formation to set up his blocks. This play requires good blocking immediately off of the line of scrimmage by the center, right guard, and right tackle to allow the play in the backfield to form. Next it requires good patience and vision by the running back to execute. Finally, it requires an athletic backside guard and tight end to execute their drive blocks on their defenders. This play showcases all three components and is very successful. Now this play raises an important question: Do you need a good blocking tight end to execute this play? The Redskins currently don’t have a top blocking tight end. Cowboys’ tight ends James Hanna and Jason Witten are both very good blocking tight ends. The Redskins have Logan Paulsem, Niles Paul, and Jordan Reed on the roster. None of them are particularly great at blocking. Paulsen is debatably the best of the group, but he was just average last season. Instead the Redskins have fullback Darrel Young who is an excellent blocker for Alfred Morris these past few seasons. 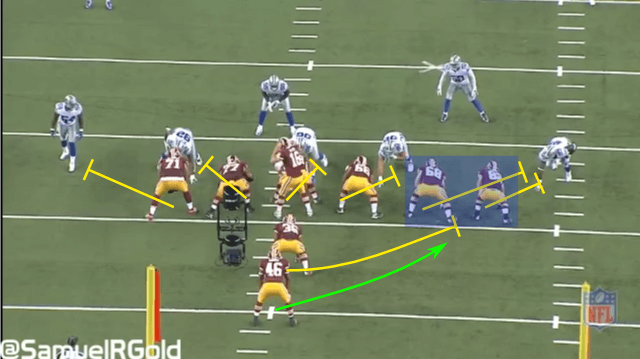 With that in mind, the Redskins might be able to run this with Paulsen or run a modified counter power running it from the Strong-I formation using Darrel Young. 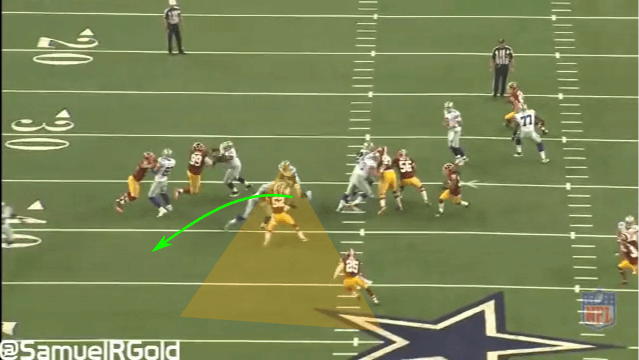 Here is another man-to-man concept the Cowboys used last season. This play is a trap running play run from the shotgun formation. 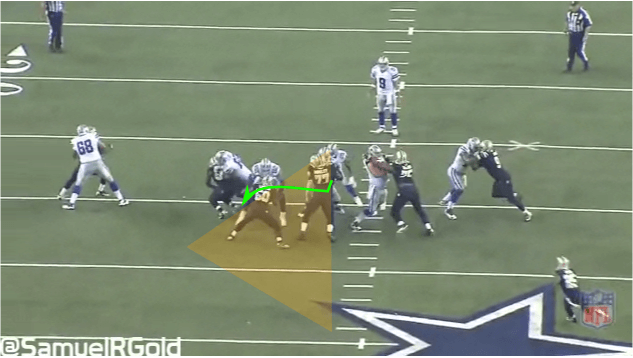 I highlighted the backside guard who pulls across the formation while the center and right guard downblock his defender ex-Cowboy Jason Hatcher. What I found interesting about this play is RT78 Jeremey Parnell. Parnell fakes like he blocking Jarvis Jenkins, but instead swim moves him to downfield block ILB52 Keenan Robinson out of the play. Murray reads his blocks and follows them upfield finally colliding with his own teammate after a large gain on the play. 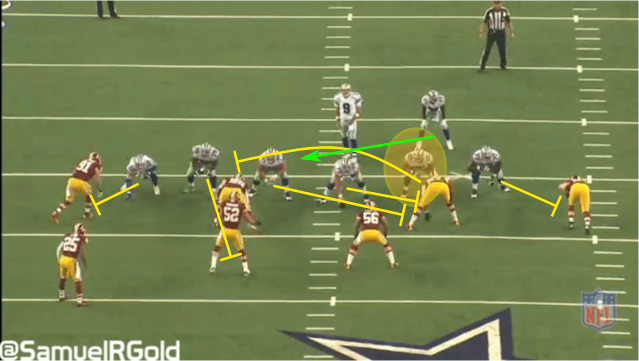 Here is the Cowboys running the one-back outside zone from the singleback formation. 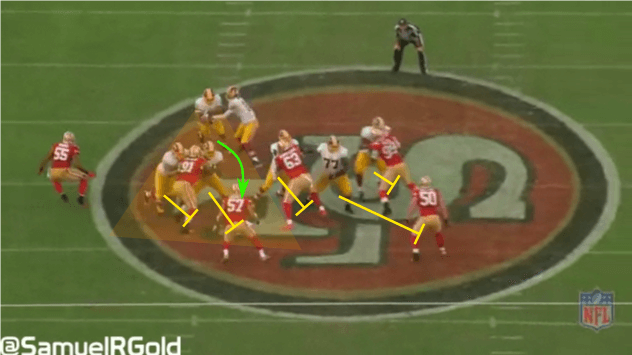 This is similar to the Redskins zone however without the fullback present. As you can see Callahan’s offensive scheme uses a variety of blocking techniques that require top-notch offensive lineman to execute. Callahan clearly has traits he looks for in judging an offensive lineman and based on the Redskins 5th overall selection of Brandon Scherff it’s clear that Callahan has already had an influence over the Redskins rebuild project. So I think based on Alfred Morris traits with his vision, patience, and cutting ability he fits as the Redskins first and second down back. The question mark is whether or not he is ready to quickly read man-to-man blocks inside as the majority of his large runs came on outside zone stretch plays. This will be his test.